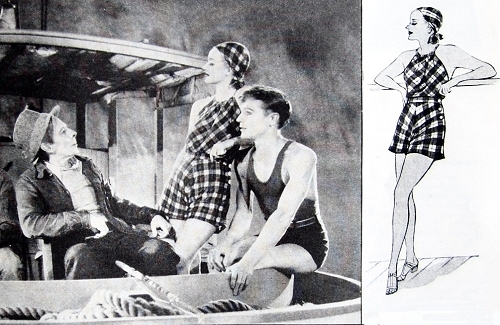 Butterick skirt 1480 was first illustrated in June, 1927, with a blouse/step-in combination (No. 1493) and a cardigan jacket (No. 1367.) Delineator. 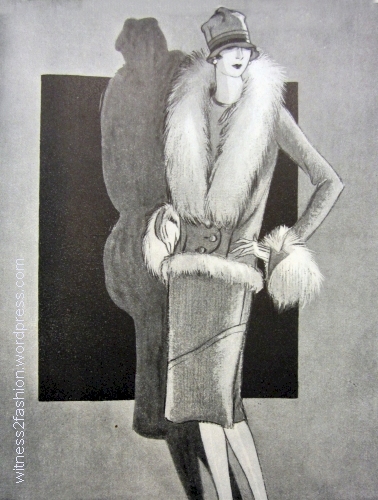 This very simple wrap skirt pattern first appeared in 1927. Surprisingly, it was still being featured — in a much longer version — in December of 1930. It had survived a major change in fashion. 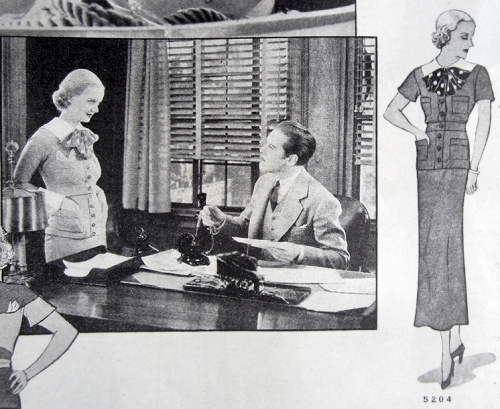 There is only one copy in the Commercial Pattern Archive, so I can’t be sure if the pattern was produced in a longer version after 1929, but it is certainly longer in illustrations from 1930. Buttrick wrap skirt No. 1480 barely covered the knee in summer, 1927. Butterick 1480 pattern from the Commercial Pattern Archive. 1927. Far right, Butterick skirt 1480 with “coat” 6603 in July 1927. Casual chic! This time, skirt 1480 was shown with a jacket-like ; the blouse opening lines up with the flap on the skirt. By Fall of 1929 the new, longer skirt had been introduced. The skirt covers the knees completely. (September, 1929.) This coat is about the length that some dresses were just 18 months earlier. 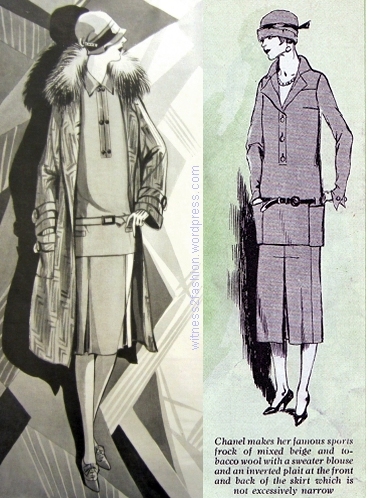 In October of 1929, skirt 1480 was shown with overblouse tucked in, in the alternate view. Butterick coat 2847, blouse 2864, and wrap skirt 1480. Delineator, October 1929. Belts are rising. Notice the back view at right. 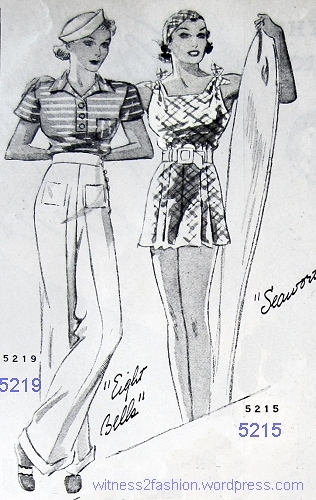 In 1927, the wrap skirt was described as “mounted on a belt that rests just above the hipbone.” In 1930 it “fits snugly over the hips at a high waistline.” To me, this sounds like two ways of saying the same thing — if the pattern was really much changed, it would have been reissued with a new number. A few months later, by 1930, skirts were well below the knee, and ways to stretch your wardrobe were… creative. By Fall of 1930, most traces of the Nineteen Twenties’ look are gone. Skirts are mid-calf; belts approach the natural waist. 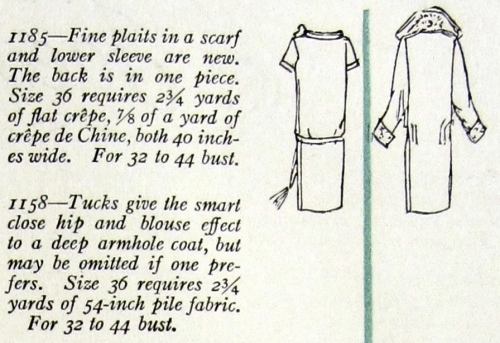 Butterick dresses from October 1930. The tunic second from left (3471) is a transitional style, like the tunics [below] that appeared at the end of the Tubular Twenties. Under the 1930 tunic: wrap skirt 1480. Three tunic blouse and costume slip outfits, 1924. Butterick patterns Nos. 5790, 5455, & 5681. A tunic outfit offers more than one hemline, so the eye can choose the length it prefers — old and long, or new and short. 1924. For more about the 1920’s long-to-short transition, click here. 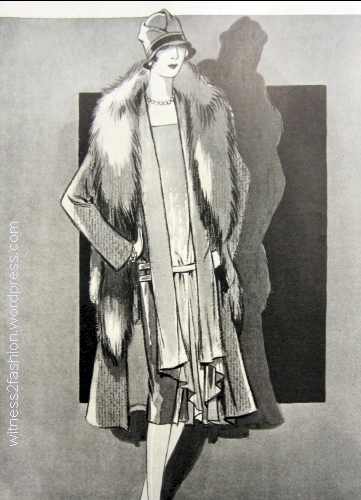 Yes, that October 1930 tunic was worn over 1920’s wrap skirt 1480. So was this one, from December of 1930. Left, Butterick tunic blouse 3560 over wrap skirt 1480; right, frock 3548. Delineator, December 1930. Stylistically, the “Twenties” are over. Why a wrap skirt should be the choice for wearing under a tunic (or over a dress!) is a mystery to me. But, as seen, easy wrap skirt 1480 survived a fashion earthquake. P.S. 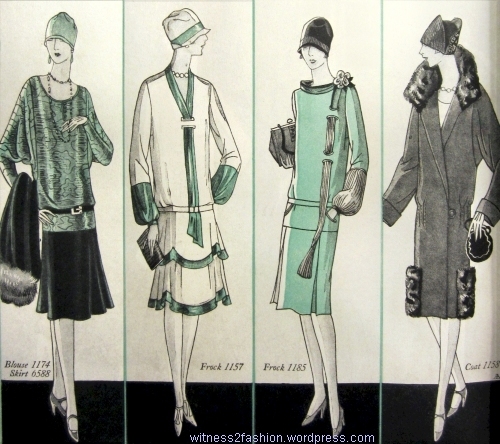 Looking at the tunic dresses of 1924 and 1930 I was shocked to realize how little time elapsed between them. The short-skirted Twenties were short indeed. 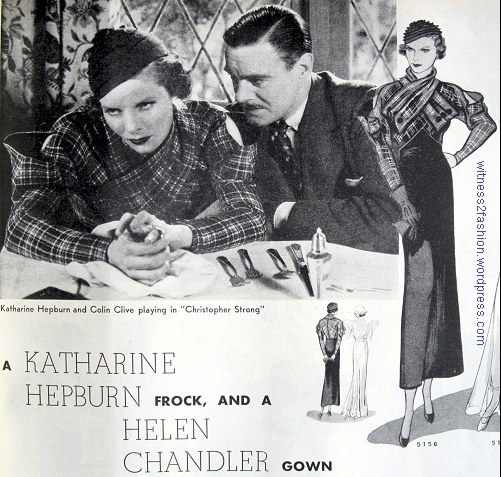 Katharine Hepburn in Butterick Starred Pattern 5156, Delineator May 1933. P. 71 From the movie Christopher Strong. 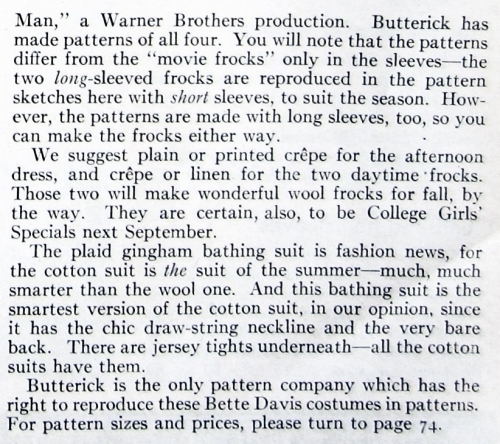 As far as I can tell, in 1933 Butterick decided to take advantage of the movies’ influence on fashion by issuing a dozen patterns that were exact copies of the clothes worn in films. The costumes were designed by Orry-Kelly, Travis Banton, and Howard Greer for actresses Bette Davis, Katharine Hepburn, Kay Francis and Mary Astor, among others. The series was called Butterick Starred Patterns. The movie studios cooperating with Butterick were Warner’s, R.K.O., and Paramount. SoVintagePatterns.com has many Hollywood patterns for sale. Click here and see if you find your favorite actress. Click here to see the Hollywood pattern version of a Scarlett O’Hara dress, translated into a 1939 evening gown or day dress. Bette Davis in The Working Man, and Butterick pattern 5215, a halter top bathing suit. Delineator, June 1933. 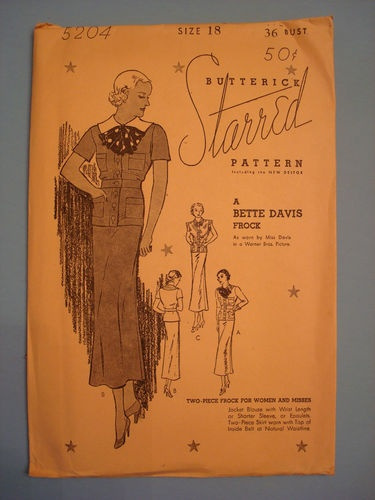 As it happens, I have just finished going through all 12 issues of Butterick’s Delineator magazine — in which “Starred” Patterns were publicized — from 1933. From April through August, The Delineator featured a different movie each month, with illustrations of the patterns on the same page as photographs of those exact outfits being worn in the film. Delineator, June 1933. p. 63. 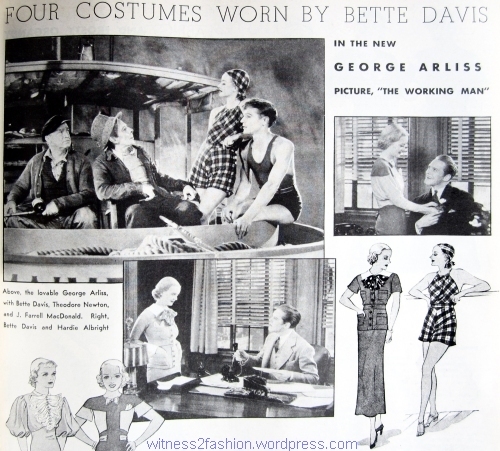 Four Butterick Starred Patterns designed for Bette Davis by Orry-Kelly in the film The Working Man. 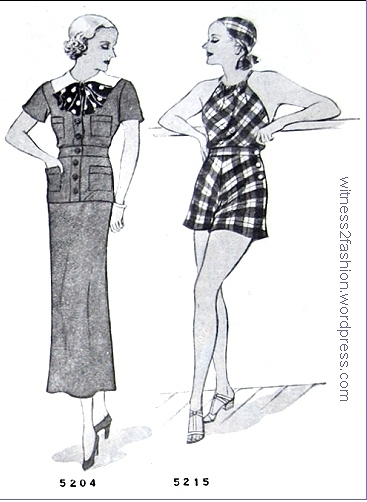 Bette Davis’ bathing suit 5215 in The Working Man is searchable as Butterick 5215 C in the Vintage Pattern Wikia. The pattern envelope shows another, pleated version, too. That view was featured in Delineator’s July issue. It’s been named “Seaworthy,” and there is no mention of Bette Davis or the movies. 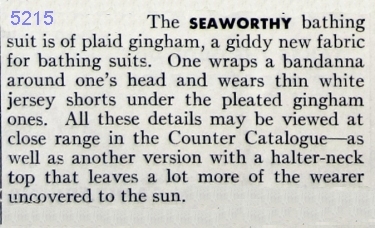 Butterick bathing suit pattern 5215 — “Seaworthy” — in a feature about resort wear. Delineator, July 1933. 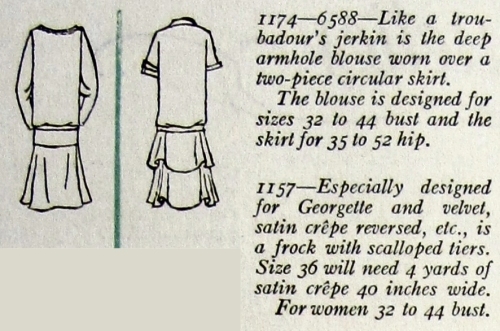 Butterick 5215 as described in July 1933. 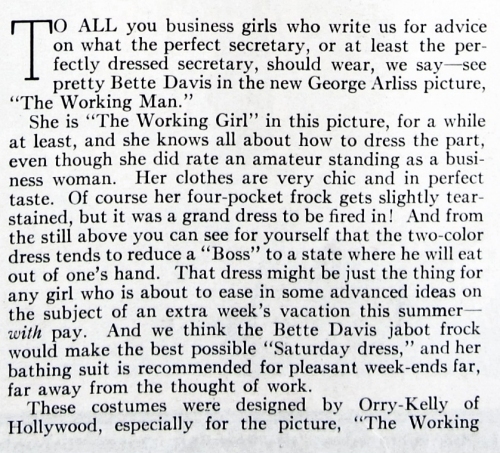 Two Orry-Kelly designs for Bette Davis in The Working Man. Butterick Starred Patterns 5204 and 5215. June 1933, Delineator. Butterick Starred Pattern 5204, a “four pocket” dress for a secretary. Delineator, June 1933, p. 63. “It was a grand dress to get fired in.” 5204 is not in the Vintage Pattern Wikia, but click here to see the envelope. 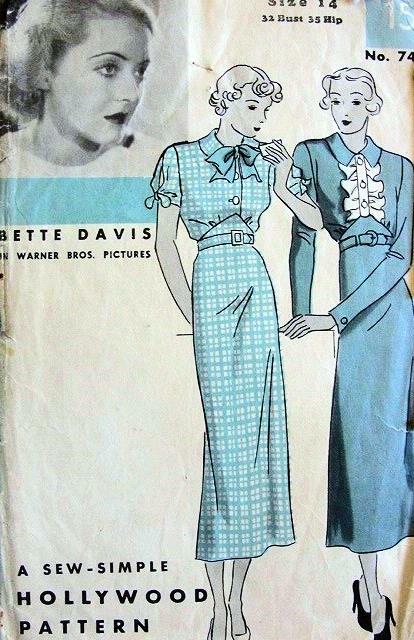 Butterick Starred Patterns 5212 and 5214, designed by Orry-Kelly for Bette Davis. Delineator, June 1933. 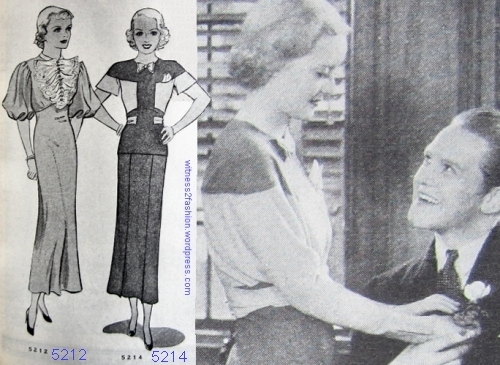 Right: Bette Davis in the dress which Butterick copied as pattern 5214. Delineator, June 1933. Bette Davis Starred Pattern 5214 is listed in the Vintage Pattern Wikia as 5214 B. Patterns 5204 and 5214 had long or short sleeved versions, so buyers could make an exact copy of the movie dresses. 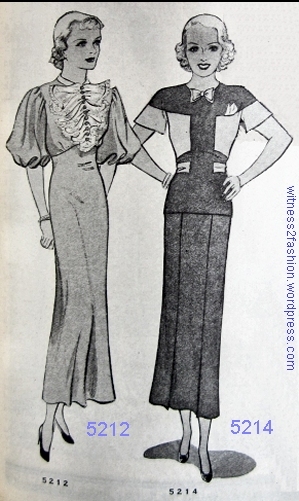 The “jabot frock” on the left, above, “would make the best possible Saturday dress.” Bette Davis Starred pattern 5212 is also in the Vintage Pattern Wikia. Orry-Kelly and Bette Davis didn’t like each other, according to Jorgenson and Scoggins in Creating the Illusion, but they realized that they complemented each other’s work. They made forty-two movies together in a period of fourteen years. “Working with Bette Davis isn’t easy, but she’s worth it. She’s honest and outspoken. She’s one of the very few actresses I know who can look in the mirror and tell herself the truth. When I’m ready to give up and throw out a dress, she’ll give it a hitch or a twist and turn it into something great.” — Orry-Kelly, quoted in Creating the Illusion, p. 171. Orry-Kelly has an astoundingly long list of movie design credits (Filmography) at the Internet Movie Data Base (IMDb), but he didn’t design all the costumes in all those movies. Studios often listed a department head or supervisor as the “designer” on films. Much of the work was done by assistants. However, established stars developed working (and sometimes fighting) relationships with studio designers. In addition to all those Bette Davis pictures, you may remember Orry-Kelly’s costumes for Gold Diggers of 1933, Casablanca and Some Like It Hot. 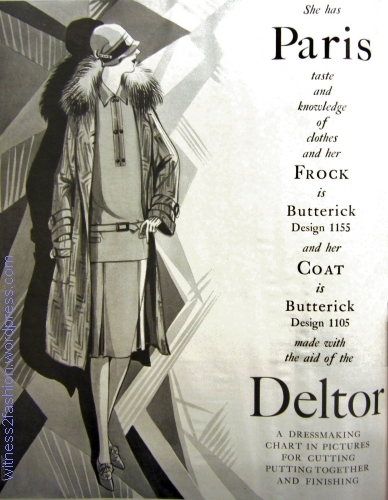 Butterick Starred Patterns, Part 2: Orry-Kelly designs costumes for Kay Francis, and Butterick makes patterns from his designs. All three of these undated patterns were dated to 1974 using the CoPA Sample data search. What a great reminder that 1960s styles influenced fashion well into the 1970s! If you are interested in costume history or vintage sewing patterns, you will probably enjoy a visit to this amazing website. The Commercial Pattern Archive (CoPA) is a searchable database — with pictures — of more than 56,000 vintage patterns. It gives you access to vintage patterns from several collections: 46,500 patterns from the 1840s through 2000 in the collections of the University of Rhode Island; plus many patterns from the Kevin L. Seligman Collection at Los Angeles County Museum of Art (LACMA) (18,000 items!) and patterns from individual collections and other museums. More patterns are being scanned and added regularly. The CoPA site is a project of the Costume Commission of the USITT. (The United States Institute for Theatre Technology.) Theatre Technology isn’t just about lighting instruments and scenery materials; over the years, the Costume Commission — people who design and build costumes and teach costume history, etc. — has become its largest (and a very active) division. As a former member (now retired) of the USITT, I’d like to introduce the resources of USITT to members of the Vintage Fashion Guild, costume re-creators, vintage collectors and other researchers. We all have a lot in common! You Can Sample CoPA Searches: Give It a Try! UPDATE 1/24/2018: Since this post was written, the CoPA site has changed; according to Joy Spanabel Emery, whom we all need to thank for her work on this project, the full benefits of the site are now available without a paid subscription! You can now search by pattern number, and have access to the entire online archive. You do need to subscribe. And, if you use this site, a donation would help to keep it being enlarged and maintained. She wrote, “Since the CoPA database is now available at no cost, the Sample option is no longer necessary. At present an enrollment form is necessary for access. The from can be downloaded from the website…. We are now relying even more heavily on volunteers and financial donations to the Joy Spanabel Endowment Fund at the Rhode Island Foundation. 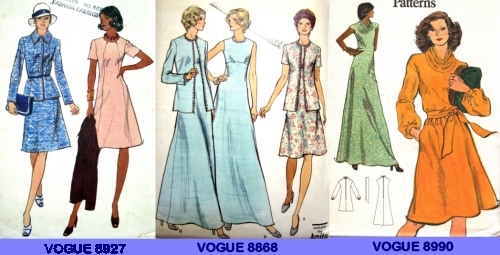 I urge you to try this amazing archive of vintage patterns! The Log In page will allow you to download the subscription form. Click here. It is now (2018) possible to search for a specific pattern number from most companies. REVISED 1/24/18; SEE ABOVE or CLICK HERE for the new, 2018 CoPA Home page. If you want to take advantage of the entire collection and be able to see images of the pattern pieces as pictured on the envelope, so that you can drape a version of the pattern on a mannequin, you will need to subscribe, but the subscription only costs about $10 a month (Minimum of 4 months. There are Group Subscription Rates, too. See below.) REVISED: 11/6/18: Membership is FREE! However, donations will help to continue expansion. Read about the history of CoPA site at PROJECT. ON the 2018 site: ABOUT US or NEWS . “All proceeds from the subscriptions are used to pay student assistants working in the archive. In addition to the patterns we have an extensive collection for fashion and tailoring materials that are available to visiting researchers. “Unfortunately subscribers can’t search with a specific pattern number. But looking at the pattern company and year(s) (determined by the style of the fashion), it is easy to determine what year the specific pattern number was issued. “We don’t include separate numerical lists of each pattern company’s numbers. However, there is an option to view a list of 200-plus company numbers for the patterns in the Archive by hiding the images. 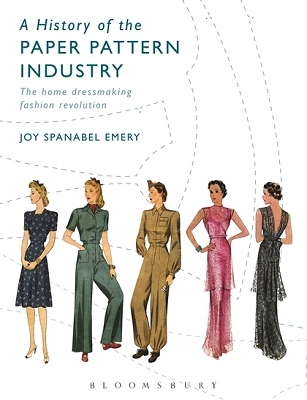 A History of the Paper Pattern Industry: The Home Dressmaking Fashion Revolution, by Joy Emery, will be published at the end of May by Bloomsbury. This should be of great interest to collectors and fashion historians. Thanks to Joy for sharing all this information in her book and on the CoPA Database, for generously including her own pattern collection in the database, and for her help in checking this post for accuracy.